I thought I'd take a few pictures for reference while tearing apart the Minolta AF 28-85mm F/3.5-4.5...the same one used in the "dirty lens article." I'm posting the images here just for kicks, I'm not trying to advocate lens repair or adjustment. 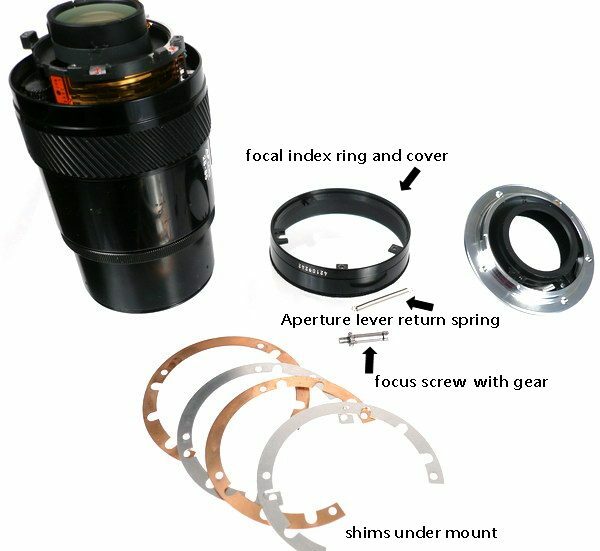 I've never looked at the guts of a lens, and thought I'd share what I found, so here's your chance to get a quick glimpse of the different parts used in its construction, and how it all goes together, or comes apart!! I'm not a lens repair expert, so some of my parts identification terms will not match factory repair manual nomenclature. This is what the lens looked like before I killed it. 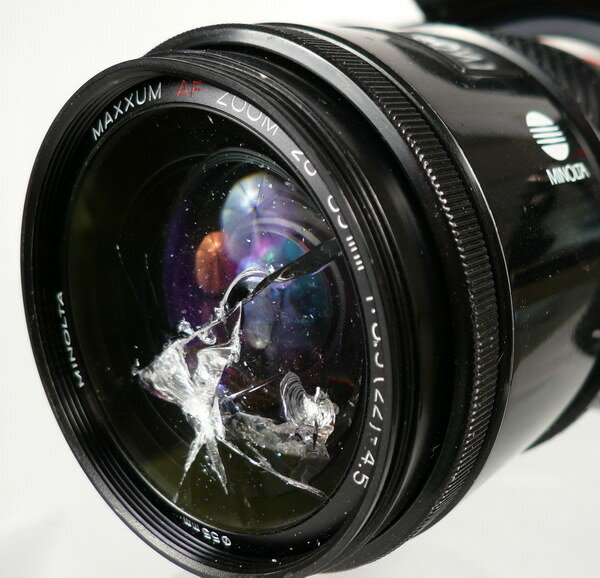 If you're interested to know why I destroyed a perfectly good lens (at first glance), go here and scroll down to the bottom of the page and read the conclusion. It takes quite a jolt to break the front element. If you want to know how well it takes pictures with this kind of damage, go to the link above. We'll start by removing the four screws around the mount, then carefully remove the other screws that attach the plastic focal index ring, and electrical contacts. Some of these tiny screws seem to have some sort of thread locker (Loctite) compound on them, which makes removal extremely difficult, I rounded off several screw heads and ended up having to break something to remove the part. I had no problem with the mount above, which came off very easy. 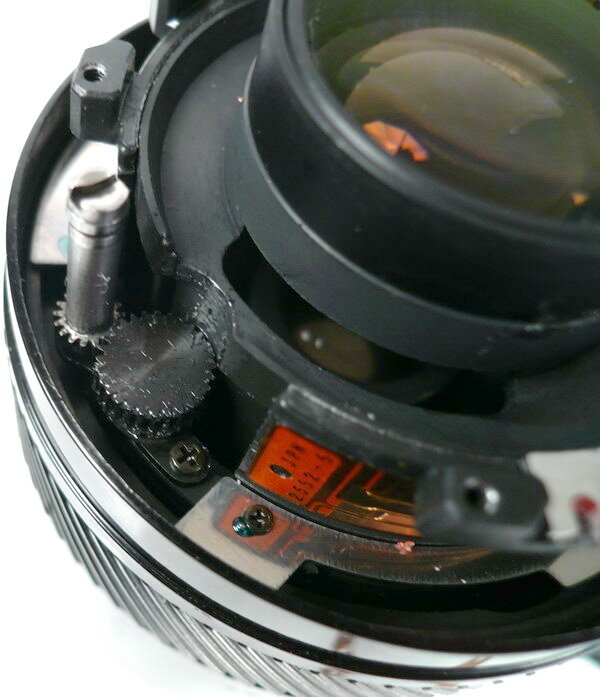 Most problems occurred with the very small screws deeper inside the lens. Also, check out the focusing screw at five o'clock, and the aperture lever at seven o'clock. This is where we're at so far, and about as far as the amateur will want to go without causing possible irreparable damage. 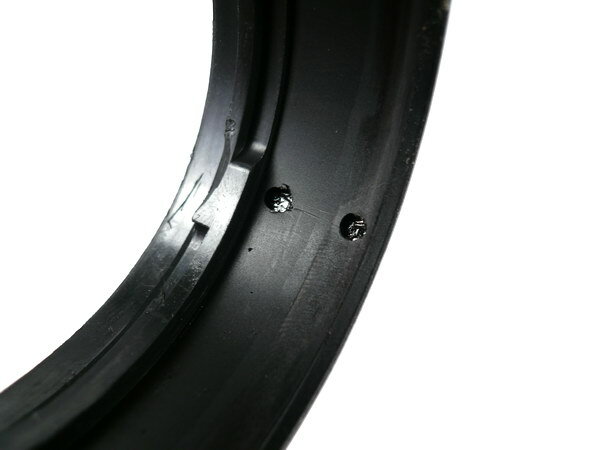 The rear lens element at the top of the picture unscrews, and would be a easy replacement for the average mechanically inclined person. The focusing screw will come loose, but is easily put back into place before setting the mount on. 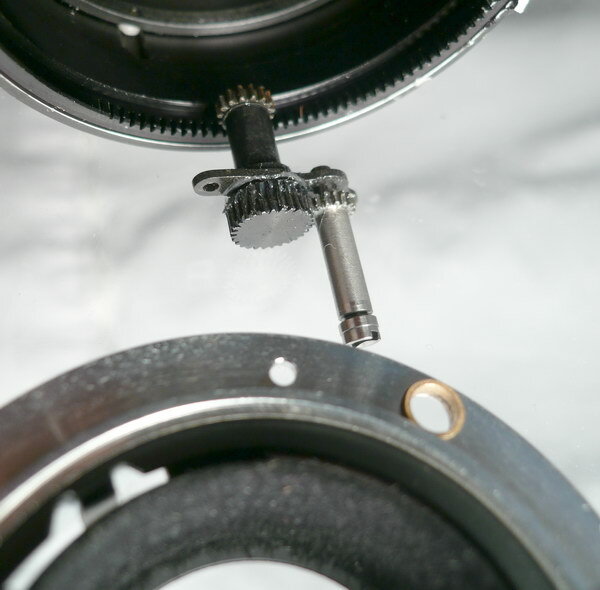 The long spring you see in the center of the image wraps around the inside of the mount, and is used to keep the aperture wide open. 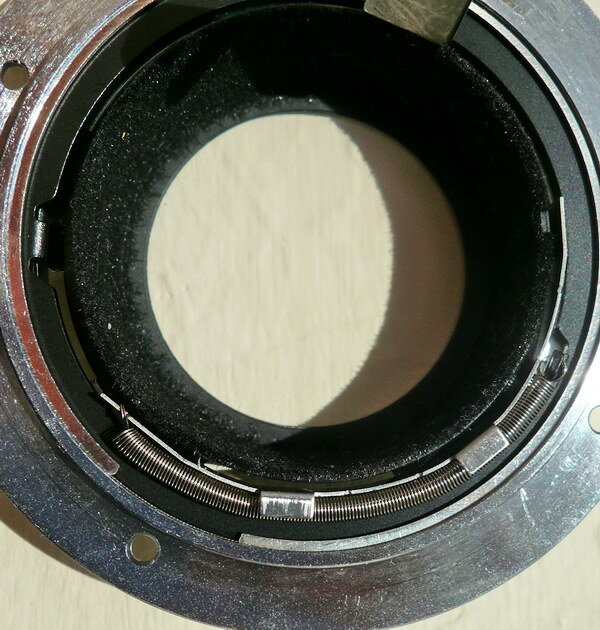 The spring came off during disassembly, so if you want to put your lens back together, make sure you re-installed the spring correctly for the aperture to work. Also make sure you place all shims back in their proper place and sequence. 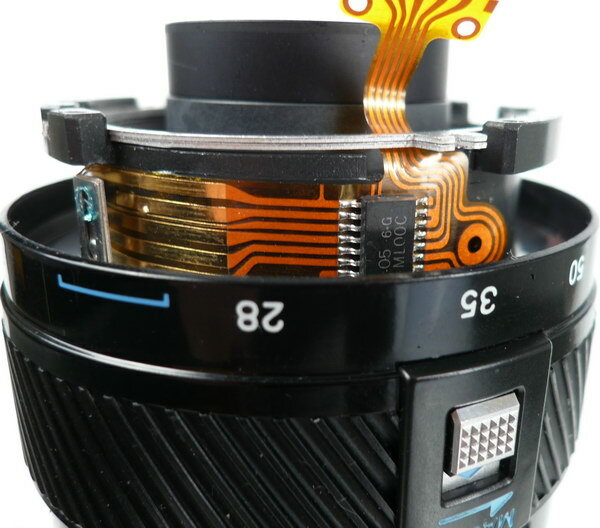 This is the correct position of the aperture return spring. 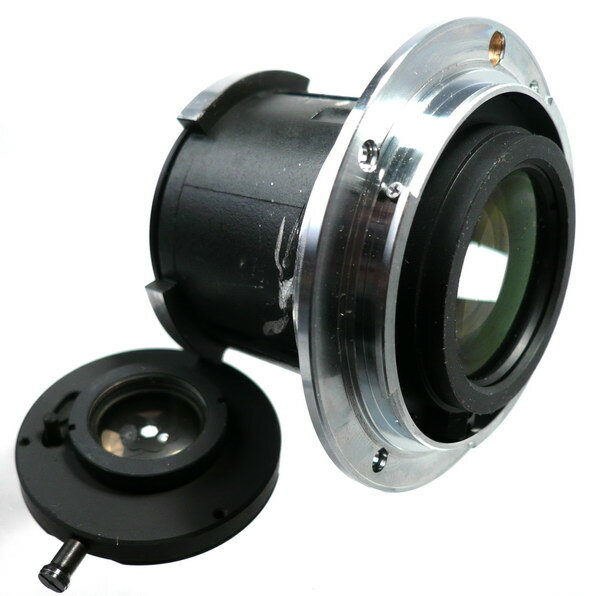 This is the only electrical part of the lens, and this particular portion is what carries information to the 5 pin contact strip on the back mount area of the lens, see third image from the top. 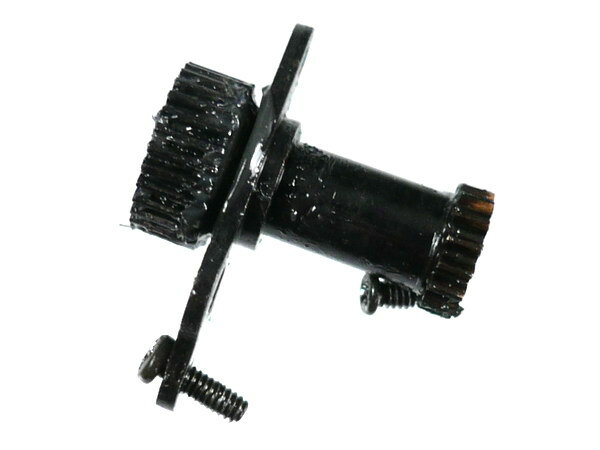 Here we have the focusing screw and transmitting gear assembly that turns the ring around the focusing barrel. I call this the transmitting gear, that's probably not the real name. It comes out easily with two screws. This is the focusing screw, you see the slot-end of this (right side of image) in a hole on the mount. The camera has a motor and blade that turns this screw for auto-focusing. Here's a better picture portraying how it works. 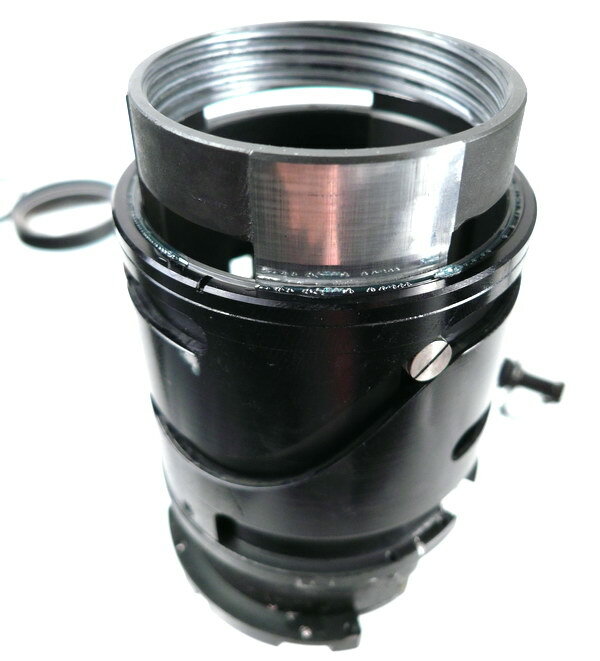 The focusing barrel is on top, with the ring gear visible. 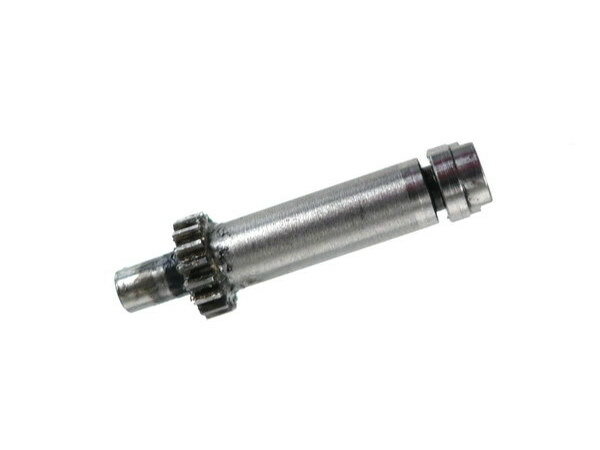 The transmitting gear bottom drives the barrel, and the focusing screw drives the top portion of the transmitting gear. You see the mount at the bottom of the image, the focusing screw slot-end sticks through that hole, and that's what you see when you look at the bottom of the lens. This is the way the lens looks so far. 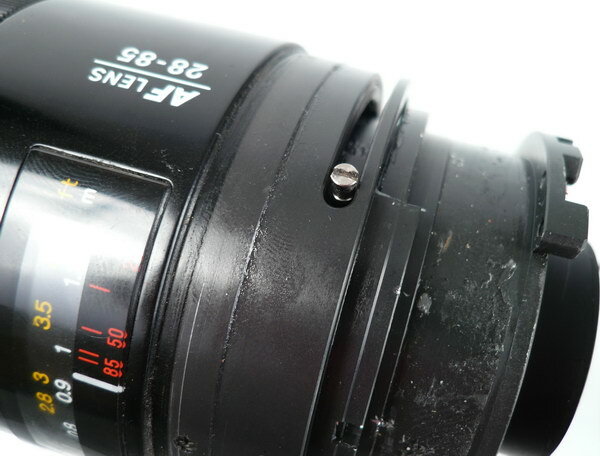 If you've taken your own lens apart this far, you probably just ruined it. Oh well, it's fun to tear something apart, even if you can't put it back together!! Notice a couple of lens elements fell out of the front! The first one was broken of course, the element behind that one might have been held with a band, I can't remember, the third one is the thick two element(?) piece you see in the image above directly by the lens barrel. I call this the aperture housing because it houses the aperture assembly. You'll notice the pin on the aperture assemble, and the slot in the housing. The aperture assemble pin simply fits with the slot in the tang, inside the housing so you know the orientation. Then a cap fits over the top. The camera moves the other side of the tang, which sticks through the mount, (shown earlier) then moves the aperture pin and blades. On a side note; the aperture assembly has three screws around the side, I took two out before I discovered it just falls out after you take the top off. 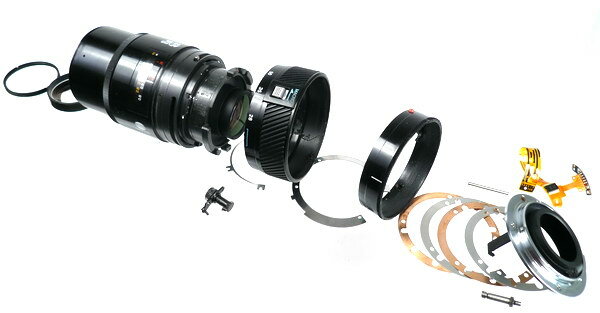 This is the orientation as you would see it mounted on your lens, without the covers and all. Notice the aperture assembly has an element over the blades. 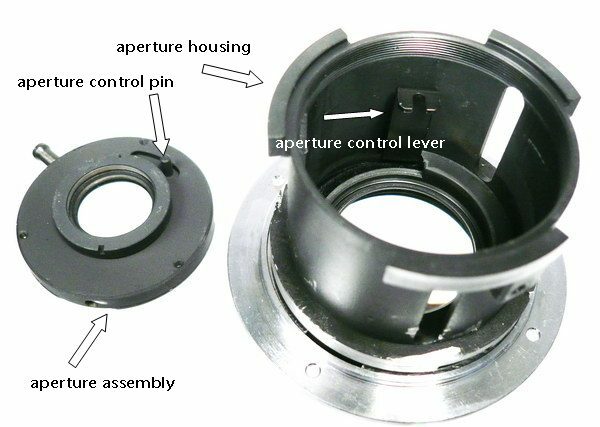 Obviously, the aperture assembly would be inside the housing. You're looking at the other side this time. The cover on the right has an element inside, and screws over the top. Now we have a view with the zoom ring removed. This is the zoom ring. 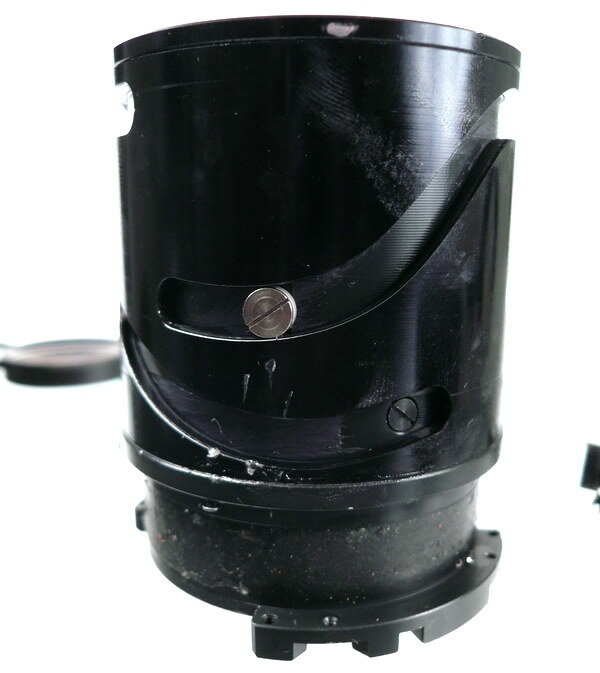 The two cavities you see here hold pins attached to the zoom housing, which in turn, move the barrel, see below. 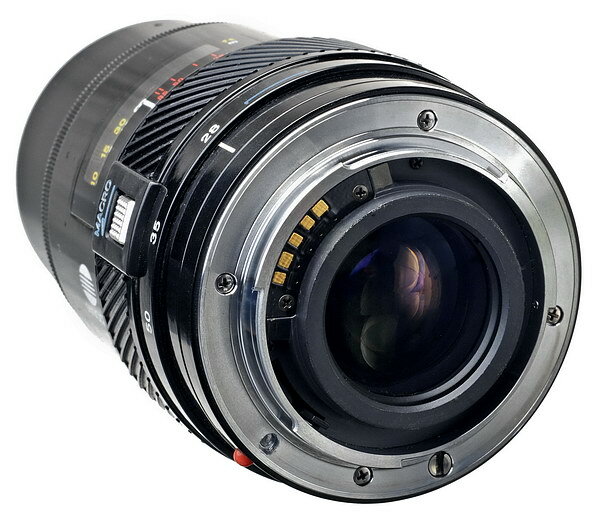 I would consider this the zoom housing, though it holds most of the contents of the lens. I'm sure it's called something different by the factory. I believe in macro mode, the silver screw is all the way over to the left. Right now I think it's at 28mm. This is near full extension. The silver part sticking up (with threads) screws into the front extension barrel, which houses the front elements. The end of the dissection. Going this far requires either skill and knowledge, or stupidity and muscle, I used the latter. Interesting facts; I found only seven individual glass elements, including the one I broke. I'm assuming most are considered multi-element. 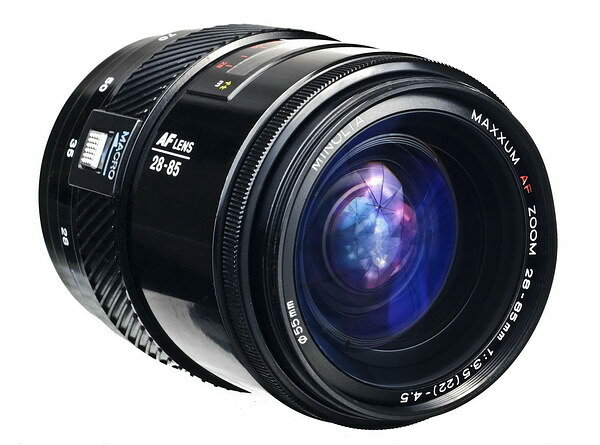 The specs say this lens has 13 elements in 10 groups. 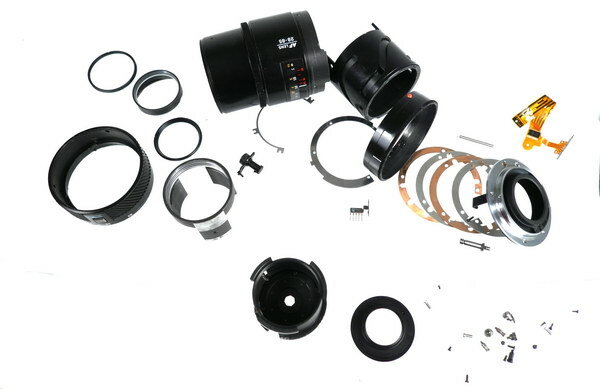 The only plastic parts I found were the zoom ring and focal index ring. That's all folks. I hope you've enjoyed watching me ruin a good lens, hopefully, you won't be curious enough, or dumb enough to do this yourself.